Having heard another speculated example in class, a classmate and I were talking about how most of what we study regarding archaeological anthropology, palaeo anthropology and physical anthropology were mere guesswork- conjectures? Dusk has always been my favorite time of the day. It brings an end to a long day of useless chatter and pointless arguements? Shillong sunset and the dusky aftermath has only reaffirned my love for this time and place of the day. After a hectic day of tests, assignments, lab practicals and academic inputs, I look forward to standing at the bus stop. The weary students all wait for the bus but I wait for the bus and the time of the day when I get to stare up the sky. 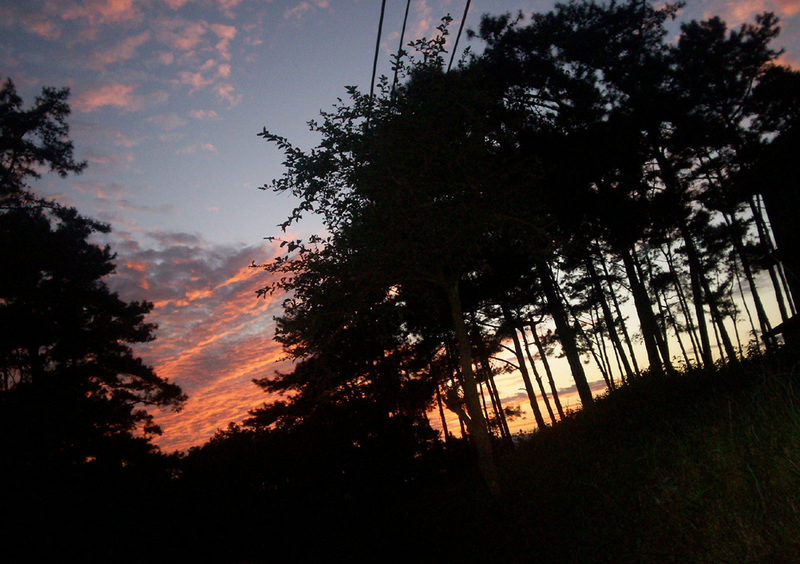 Below is a picture taken from the bus stop as the splattered shades of the setting sun is aided by the silhoutted trees. For some reason, the trees feel more alive then than when it is at its greener stage. The bus ride is exciting as the setting sun and the rising moon compliment each other to energize people like me. Dusk feels the perfect place to refresh. One evening, we chanced at this hot dog stall. It is only in Shillong where you get a “slow food joint” serving hot dogs. The vendor was a Shillong resident, German ex-teacher, who played some oldies while slicing the dogs and flipping the rolls? He charges Rs.10.00 for the sliced meat in your roll and Rs.20.00 for the whole thing. He.. he..